Stir fried golden triangle tofu, sweet basil leaves, eggplant, bell pepper, white & green onion with chef's special sauce. Choice of your favorite with steamed bed spinach, topped with house peanut dressing. Stir fried house mix greens, tofu, mushroom, cashew nuts with chef's special sauce. Grilled marinated chicken, soft and juicy. Served with Sweet & Sour sauce and Issan style dipping sauce. Grilled marinated pork ribs, moist and tender. Served with Issan style dipping sauce and Sweet sour sauce. Side dish with pickles vegetables. Choice of your favorite stir fried with coconut curry sauce, onions, bell pepper and cashew nuts. Choice of your favorite stir fried with lemongrass, sliced onions and toast dried chili peppers. Choice of your favorite stir fried with sugar pea, mushroom, baby corn, bamboo shoot and bell pepper. Choice of your favorite stir fried with curry sauce, string beans, and red bell pepper. Choice of your favorite stir fried with garlic chili sauce, eggplant, basil leaves, bell pepper and onion. 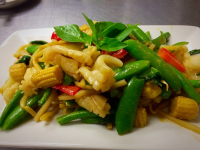 Squids stir fried with string bean, bamboo shoot, baby corn, bell pepper in light green curry sauce. 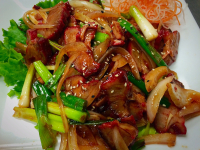 Stir fried sliced house's BBQ pork with garlic, bell pepper and green onions. Grilled marinated Chicken Breast topped with creamy green curry coconut sauce with string beans, mushroom, red pepper and kaffir lime leaves. Beef tenderloin with chef's special sauce, mushroom, red onions, and black pepper. Sole fillets with chef's special garlic sauce, mushroom, string beans, black pepper. Fresh Mussels with bell peppers, white and green onions, bamboo shoots and sweet basil leaves. Chef's special sauce with mixed house seafood, onions, mushroom, sweet basil. Deep fried fillet fish, topped with chef's sweet sour and spicy sauce, onions, red peppers, pineapples. Minced Chicken or Beef sautéed with house chili sauce, Thai basil, onions. 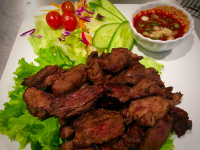 Thai style grilled steak with dry chili dipping sauce. Steam fillet fish with banana leave in light soy sauce, mushroom, bell pepper, white & green onions. Stir fried large sea scallops with Beyond's signature sauce, mushroom, green & white onions, sweet basil leaves. Steam fillet fish with Thai chili lime sauce, mushroom, bell pepper, white & green onions, sweet basil leaves and garlic. Choice of your favorite stir fried with Thai chili paste, tomato, bell peppers, and cashew. Stir fried choice of beef or chicken with white & green onions, Chinese broccoli, bell pepper, mushroom and pickle ginger. Thin sliced chicken breast with chef's special sauce, mushroom, red onions, black pepper. House's chili mango sauce stir fried with choice of your favorite, mango, white & green onions, bell pepper, topped with fresh papaya. Golden fried fillet fish, topped with spicy Thai chili sauce.